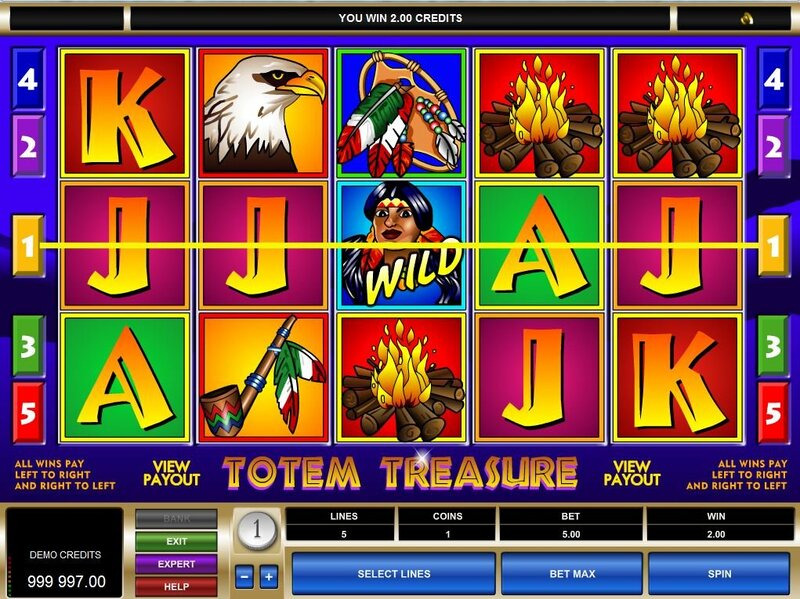 Powered by Microgaming, the Totem Treasure slot machine offers a 5-reel, 5-payline video slot inspired by Native American culture. Although the theme sets high expectations, the actual game really misses the mark. 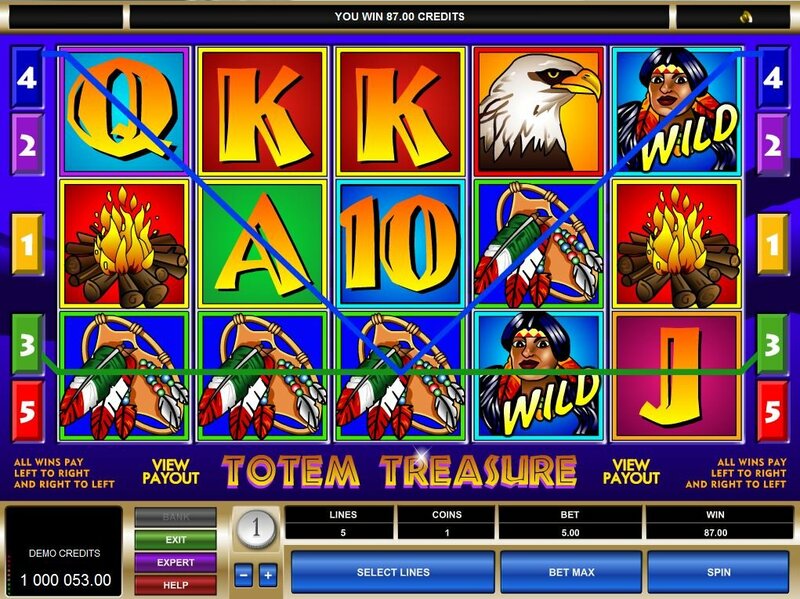 With outdated graphics and bone-dry bonus features, Totem Treasure would only please those who want the very basics from online gambling. Peaces pipes, teepees, bald eagles, camp fires, and squaws all create the experience of living among the American Indians. Unfortunately, the graphic quality seems really outdated. Where are the 3D graphics and animations? Maybe 10 years ago these slot machine graphics would cut it, but these overly basic images just don’t make the game worth the spin. I expected the Totem Treasure slot to include calming Native American chanting, but instead the sound effects sounded like a casino hall with the constant ringing of slot machines. 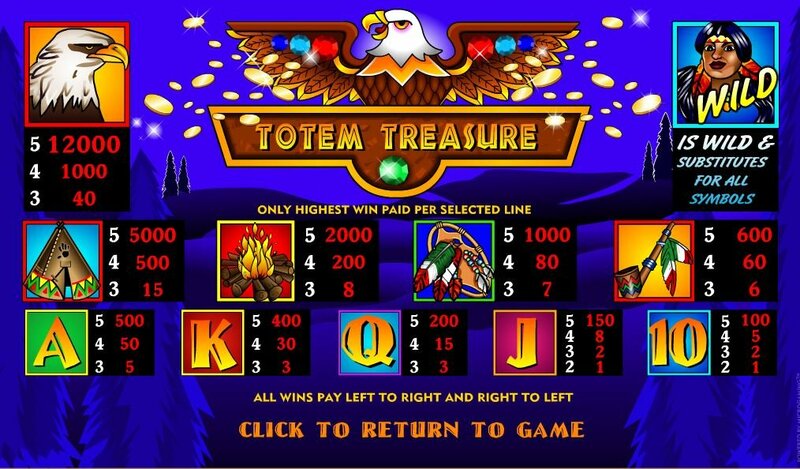 If you’re seeking a very simple, easy-to-understand online slot then perhaps Totem Treasure will satisfy your online gambling needs. However, I much rather prefer a slot machine with fun mini bonus games and gambling rounds of which this game has none. So what does Totem Treasure offer? The lovely Squaw image serves as a Wild Symbol which substitutes for all symbols. Another cool feature about this one is that all wins pay left to right as well as right to left.